Last week I had a giveaway here at Blog by Donna, where a lucky winner received a copy of LEGO: The Adventures of Clutch Powers. And I hope my winner enjoyed it as much as my family and I did. I got my DVD Saturday morning (but it seems that FedEx delivered it Friday evening but did not wring the doorbell), so Saturday night, we had family movie night. Clutch Powers is an Indiana Jones like character. It opens up with Clutch removing a yellow crystal and awakening a ROCK monster. As we know, you can build anything with LEGO so he built a catapult to blast himself out, only to discover the crystal is a baby and this is why the rock monster is upset. The rock monster gives him a crystal to thank him. It’s LEGO universe, so everything can be built or built upon. My son got some really cool ideas – he is building with his Lego blocks as I speak (or type). Clutch Powers – Our hero. Smart and fearless but human explorer. Bernie Von Beam – The love struck Swede. Brick Masterson – Tough and simply hilarious, firefighter. Artie Fol – The scientist, kind of absent-minded professor and Clutch Powers’ biggest fan. Mallock the Malign – The evil wizard that breaks out of prison, to get the sword of Prince Varen. Prince Varen – All around good guy, Prince. Skelly and Bones – Are Mallock the Malign’s bumbling minions. Hogar the troll – This lovable troll is protector of Prince Varen (and my favorite character). Lofar the Dwarf – Another good guy. Clutch Powers is a cool… everyone knows him, kinda guy. There doesn’t seem to be much he can’t do. He works at LEGO headquarters with his team of “expert” builders. The team go to the Prison Planet to investigate the recent breakout of three vicious prisoners. The most evil of these being Mallock the Malign. And Mallock overpowers them and takes their spaceship. Clutch feels responsible because he is distracted by a book with an “Omega” symbol in it and it just so happens that this symbol has a connection with Power’s father – who by the way has been missing for a long time. But being the expert builders they are – they soon take off after Mallock. I don’t want to spoil the movie – you really should watch it yourself with your kids. It is a fun and entertaining movie. It has enough elements in it that will keep an adult interested without resorting to inappropriate language. I’ve found that more and more “kids” movies use tactics that will keep parents interested but are not appropriate for young kids. There are several funny one liners in this movie that had my son and I both laughing. 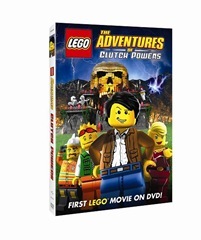 The biggest message your children will take away from LEGO: The Adventures of Clutch Powers is – team work. Sometimes we need help. And working together with others can be very rewarding. Also on the DVD is an exclusive bonus short film – Bad Hair Day. It focuses on A. (Artie) Fol and is very cute. I give LEGO: The Adventures of Clutch Powers a 3-star and Cody gives it a 4-star. In this case, Cody’s rating trumps mine… so this is a must-see DVD or digital download. I hope you don’t mind — I’ve been telling all my friends about your blog.